Sir Edward Hyde 1st Duke of Clarendon, King Charles I’s First Minister and father of King James II’s first wife Anne Hyde. 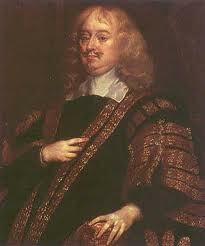 Clarendon was grandfather of the last two Stuart Queens of England Queen Mary II and Queen Anne. Thomas Middleton. Annals of Hyde and district : containing historical reminiscences of Denton, Haughton, Dukinfield, Mottram, Longdendale, Bredbury, Marple, and the neighbouring townships. conveniences when a few years of so-called progress can bring about so great a transformation. to their rank and position. There are traditions which claim that one Lord Matthew de Hyde erected a castle in these parts as far back as the 12th century. Lancashire. It was demolished in the year 1857.
gatherings. It is also a popular rumour that Queen Anne first saw light in Hyde Hall, and it is claimed as a fact that the two princesses of James II. frequently came down to the hall, on long visits to their relatives at Hyde. However that may be, it is beyond all dispute that the family of Hyde is of great antiquity and corresponding fame. Arms : Azure, a chevron between three lozenges ; Or Crest : A raven or crow, wings elevated, sable (sometimes depicted as an eagle or a hawk). Soon after the doomsday the township belonged to the Baggeleghs, who were styled “Lords of Baguley and Hyde,” but as early as the days of King John, we find one moiety in the possession of a family bearing the local name De Hyde. Ellen, married Sir John Legh, of Booths, ancestor of the Leghs of Baguley and Adlington ; the other, named Isabella, as shown later, married John de Hyde, of Hyde and Norbury, whose descendants succeeded to a moiety or half the manor of Hyde. It appears from an inquisition that this moiety was held under the Leghs of Baguley. Derbyshire. This Robert is described as ” Lord of half of Hyde, and of Newton or part thereof, in Cheshire ; Shalecross and Fernely in Derbyshire, and Haughton and Denton, in Lancashire. of two sons, John and Alexander. The first-born, known as John del Hyde, succeeded to the estates, and Alexander became the progenitor of the Hydes of Denton, settling on an estate which his father had given him on the Lancashire side of the river Tame. This same Alexander had grants from his brother of all the latter’s lands in Romiley and Denton. From the union with Isabel Baggelegh there was issue John de Hyde, who was knighted before 1353. He served with the Black Prince in the wars of the period, and was engaged, under the banners of the Earl of Chester, fighting the cause of England at the battle of Poictiers in 1356, when John, the King of France, was made prisoner of war. Sir John Hyde is chronicled as having led seventy-one archers to the king’s wars. This warrior married (either Margery, daughter of Sir Thomas de Davenport, of Wheltrough, or as some give it, Margaret, daughter of Sir John de Davenport), and through his fourth son Ralph, became the ancestor of the Hydes of Urmston. He sold his interests in the manors and lands of Shallcrosse, Godlegh, Newton, Fernelegh, Heigham, and Heiton. most probably heir to the eldest son Roger. William is thought to have married the daughter and heiress of Sir John Davenport, of Bramhall, and most likely died without surviving issue, hence the succession devolved on the third son Robert. John de Hyde married Matild, daughter of Hamon de Masci, of Rixon. Their heir was Hamon or Hamnet Hyde, of Norbury and Hyde, who died before 1476, and was eventually succeeded by his second son, Thomas Huyde heir to the elder brother John. Thomas married a daughter of Kniveton, of Underwood. He was exempted from serving on juries, August, 1511. In 1542, we find Robert de Hyde, the son of Thomas, in possession.